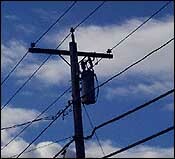 The telephone pole that captures my attention nursed no life-long ambition to telecommunications greatness. It was once a Douglas fir towering nearly 80 feet above the forest floor. Its trunk sways gently as the winds pass over its mountainside. Its great arms, clothed with successive layers of green foliage, shade the understory plants. Yet one day the sound of a bulldozer disturbs its mountain fastness. The whine of chainsaws sends a chill through the trees, and they fall one by one, fodder for the mill downstream. Rrrrrr. Chainsaws lop off each limb that protrudes, and mighty jaws lift the giant amputee on board a truck headed for the mill. Inside the sound is deafening. The debarker whines and bucks as it slices through branch stubs and reduces them to submissive knots. Layer after layer of bark and outer wood are peeled back until the trunk is naked and smooth. Its base is plunged into a vat of burning creosote and preservative forced into its pores with unremitting pressure. Violence now complete, the new telephone pole is stacked with brother poles on yet another truck. And one day he feels himself drop to the side of the road. A crane stretches his top to the sky and lowers his feet into a deep hole. The pole is now pierced by climbing spikes and crossbeams, connectors and insulators, then strung with humming high voltage lines. Phone conversations and TV shows pass under his artificial limbs, but he does not hear them. For the most part, he stands in stillness and ponders his fate. An occasional car whishes by, a hawk rests upon his head for a few moments waiting for rodents to stir in the field below. But mostly he stands stoic and sterile — never to grow again, never to bear cones, never to see young ones grow up between his toes. All he can look forward to are the cracks and fissures that come with dryness and age. He will feel the water of snow storms melt and trickle down those cracks into to his feet. It is there, underground, that he will eventually rot and decay 30 to 40 years hence. When he can, the pole lives in the fragrant memories of his past, not in the stark hopelessness of his present. My life hasn't exactly gone as I had planned either. But I realize that the telephone pole silhouetted against the sky has found a new meaning to his life that he had no reason to expect. Birds flutter near his top. Now, one of them inches down the pole and suddenly inflicts a new violence upon him. Bang, bang, bang. The woodpecker drives his sharp bill deeper and deeper into the pole's fibrous tissues. Bang, bang, bang. The hole is deep enough now. Peck, peck, peck. The bird splinters the sides of the hole to widen it. It flies away momentarily, but now returns with something in its beak. It jams an acorn into the new hole until it is firmly wedged. And now the bird and his friends begin again. Bang, bang, bang. Peck, peck, peck. As I look carefully, I can see that this particular telephone pole has been a favorite of generations of Acorn Woodpeckers. Every deep crack, every widening crevice is jammed with hundreds of acorns from the Live Oak tree across the road. Every hole whittled out in years gone by is restuffed with an acorn against the coming winter. I try to count them, but soon give up. Their number is beyond hundreds and must be more than a thousand — enough to feed an entire colony of woodpeckers the whole winter long. They will not starve, for their food tree — their sterile food tree friend — sustains them. The childless fir will live on in the woodpeckers and their hatchlings. And as I see the pole surrounded by its woodpeckers, bearing a harvest not its own for a family not its own, I sense it has grown more philosophical, more thankful with age. Few trees aspire to be telephone poles, you know, but for many that is their destiny. Often we can feel only pain and loss. We suffer. We hurt. We feel sorry for ourselves. But sometimes, if we can grasp it, God is creating for us a new and wonderful life through that which has died. Who would think that an aging pole could be thankful for a colony of woodpeckers? Who indeed?